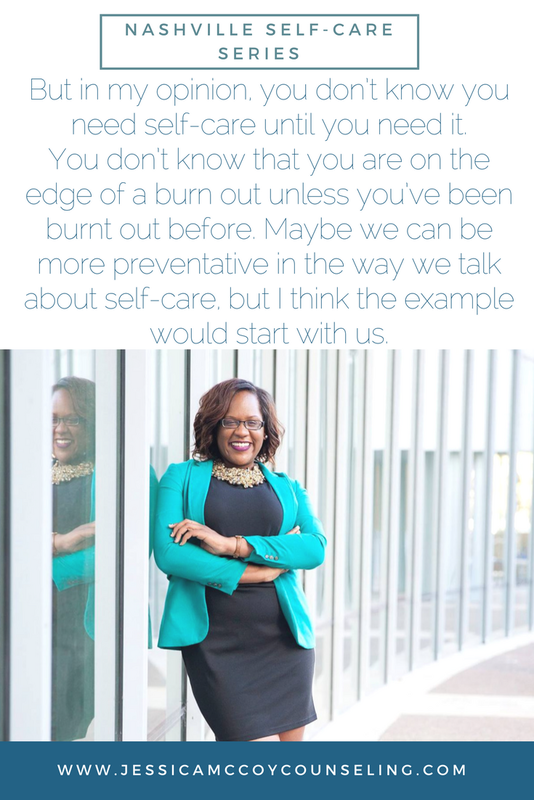 The Nashville Self-Care Series continues with the lovely April Moseley. April shares how she uses self-care to take care of herself as well as to have a healthier version of herself show up in her marriage and family. There is no "right" way to be a mother, but April offers a compelling vision of how self-care can help you be more like the mom you want to be. Well, I’m currently on maternity leave from my writing job so I’m leaning super heavily into the Mom part of my job. So right now my workday looks like playing Magnatiles, pretend, and hide and seek with my 2.5-year-old son in between nursing sessions and tummy time with my 2.5-month-old daughter. There’s a lot of making PBJs and reading children’s books and rocking and kissing boo-boos and watching the same three Disney movies on repeat and praying for temperatures above 45 degrees so my toddler can run off some energy at the playground instead of breaking everything in my house. And let’s be honest.. there’s often a 4 pm text to my husband asking what time he’s coming home to help! When maternity leave ends, I’ll still do all these things daily in my workday. I’ll just add in writing during naptime or going to a coffee shop one day a week for a few hours to read and crank out a few blogs. Daily - It varies for me day to day. Oftentimes, it’s harnessing the quiet space of naptime for me to drink a cup of coffee with my journal and some music on. Practicing gratitude daily is important to me as well - this is often at dinner or bedtime or sprinkled throughout my day. Sometimes self-care is a 15-minute podcast that slows me down, centers me, and helps me get back in my body. It’s important for me to stay in touch with what’s going on for myself physically, spiritually, and emotionally each day in this taxing season with little babes or else it can come out sideways at one of my kids or my husband. I also try to read a book at some point every day. Sometimes it’s only when I lay down at night, sometimes it’s while I nurse my baby, sometimes it’s when my husband gets home and I escape to the bath for 20 minutes. Books have always been my best medicine and best escape. And coincidentally, I believe reading is also one of the most important practices for a writer. It’s hard to write well without reading well! Oh, and SLEEP. I try to prioritize my sleep as a self-care practice these days because a better-rested mama makes all the difference in the world. Weekly - One of the most important weekly practices of self-care for me as a mom is connection. Every week does not look like calendars full of play dates to cool places with other moms and kids. Sometimes there’s a playdate to another mom’s house or them to mine so I can interact with an adult, sure. But a lot of weeks it just looks like a phone call to someone - maybe in my life phase, maybe not. Just a human being I can reach out to so someone knows how I’m doing if I’m okay, and where I need help or encouragement or prayer. Usually, it’s a friend who can say “man, I’ve felt that same way before too and it is so hard” and that empathy is the best care so many days! Connection to others, particularly other moms, keeps me out of depression and intense loneliness as well. Also, not quite each week but definitely spaced out over the month or so, I see a therapist, a spiritual director, and talk with a mentor. I also try to get together with a few of my friends in a book club each month and that does wonders for my mental health! And every year, we make space as a family for some sort of vacationing - both with and without our kids. We need that space to breathe, to dream, and to cultivate space for wholehearted living without the distractions of everyday life. We always try to think hard about what we need before planning those getaways. Sometimes we need to laugh and play and sometimes we need connection to each other and sometimes we just need rest - especially at this stage! And then once we go, we try to be intentional with that time to get what we need. Sometimes we have to get creative when money is tight, but ultimately we’ve decided that even though things like vacations and therapy are expensive, our mental health and family health is more important than any physical item money can buy. And my gut says our children will be when they grow up to have a healthy family they want to come home to than the best and latest toys and cars and clothes. Honestly, it’s changed everything to offer myself compassion and care. I find that if I’m not filled up and cared for in my mind and soul, I have very little to offer my children, my husband, or my job. It’s also important for me to be challenged and learning always. Without that opportunity for growth, I feel stuck and uninspired. Both my spiritual director and my mentor are intentionally a good bit older than me and my counselor is just a little ahead of me in years as well. It helps me to have a perspective from different generations to keep me from being so singularly focused on these little years with kids where the days are often so very very long. And the inspiration and growth I’m experiencing gives me tools and ideas I can share with others in my writing career. It also really improves life for my husband to have a wife who is continuously working through her issues, especially since some days with little babies have you up all night and it’s hard to remember to even brush your teeth, much less offer kindness and grace to the people in your home. Lack of sleep and lack of energy, a baby that needs to eat every 2 hours, a toddler who would much prefer to have every bit of my attention who also never stops talking or moving. The little years with kids are just so all-encompassing. Literally, my whole body is being used at all times. So it’s really hard to prioritize myself when their needs seem so pressing. They are always sick or frustrated or learning or have something seemingly important I can’t miss going on. But if I don’t prioritize self-care, they get a strung-out, stressed-out, bitter and exhausted Mom and that helps no one. It also leaves me with nothing to offer my job. I’d say prioritizing is the biggest key for success in taking care of myself in order to take care of my family and provide for my job. It is truer than ever: if I don’t love myself, I have so little love to offer my family and the world. Just this week, I sat down with a pen and paper and made a list of just a few things I needed just for me and then a few things my family needed (and let’s be honest - that list was really more than a few - that’s one of the biggest obstacles too - they all need so much!). And then I went back and forth doing things on the different lists. It was a simple practice but it helped! I got myself a dentist appointment scheduled and called my doctor and those are just simple self-cares I’d never neglect for my children! Clearly, I’m still in process but I’m learning to value myself like I value them. But those other tiny humans, which are my main job right now, are the biggest obstacle to my self-care themselves, no matter how much joy and satisfaction they bring me as well. Monthly spiritual direction is my favorite self-care practice I’m implementing this year. I’ve found that it is really hard to be connected each week at church with little kids that get sick or a baby you’re trying to help not cry in the back of the service. So getting together with someone who helps me notice what’s going on in my journey with God feels really important. I also set a goal for how many books I want to read this year using an app called GoodReads. Having a goal keeps me motivated to keep going through the list of all the different kinds of books I’ve been excited to read. Oh and I’m also trying to practice the ancient art of asking for help when I need help. Sometimes as moms we think we need to be superheroes and do it all. But gosh, motherhood is hard and life is hard and I need help a lot! As a general rule, I think the Mom world isn’t the best at promoting self-care. It almost seems counter-cultural to “need” self-care as a mom, even in these days of growing female privileges. The generations before us as well as what I saw in movies and books made it seem like the years with young children were about totally forgetting yourself and sacrificing all your uniqueness and passions to cut grapes in half all day and be at every field trip with perfectly packed lunches and a surprise while leaving your home in immaculate condition. And I think women are still fighting against that and often don’t know how to value themselves while wiping bottoms and helping with homework. So how have I seen self-care promoted for us? I’ve had to seek that out, honestly. By that I mean, my therapist really promotes it and encourages it, nudging me further in my belief that a healthy mama makes healthy kids not total neglecting of the self. And my favorite author promotes it talking about what she’s learned from the mistakes her mom made along the way. Other moms I know promote self-care sometimes too. That’s the crazy importance of being in community with other moms.. there are other people to notice when you're headed off the deep end again and aren’t caring for yourself anymore. I’m eternally grateful for those few friends who remind me I’m doing enough and deserve love and attention from myself, even on days my son has watched a movie three times. I’m hopeful the times are continuing to change in valuing the difficulty of motherhood and how necessary self-care is as even celebrities like Kristen Bell have started vocalizing this need. In the writing world, you kind of have to seek out voices rallying for self-care too, since it can be a bit of a lonely job, particularly when you’re doing it part-time as a stay at home mom. Other writers have led the way for me, whether in blogs or books or podcasts. Another reason it’s forever necessary to stay connected to others in this job! To see moms thriving as they learn to value themselves and care for themselves is to see children thriving as they learn to value themselves as well. How can we offer our children what we don’t offer ourselves? So not just the industry of momming would change, but the humans we raise as well. So it might actually change the whole world. I think it would change the tone of marriages as well if moms were to better care for themselves. And what a gift we would give to our spouses and our children if we weren’t all laced with strung-out, stressed-out days and heaps of bitterness and resentment. Perhaps through good self-care, we won’t arrive at the empty nesting years not knowing our spouses or ourselves. April Moseley is a mom and a writer with a background in marriage and family therapy and campus ministry. April received her undergraduate degree in psychology from Lipscomb and her Masters from Trevecca Nazarene University and still resides in Nashville, TN. She's an avid reader, a frequent baker, and a lover of words and people. She enjoys continuously learning and sharing on emotional health, spiritual growth, and safe places to land. She spends her free time channeling Joanna Gaines and bargain hunting to create a peaceful, inviting, and functional living space for her family and friends, specifically her husband Josh and their children - Jude and Haddie.